A funny thing happened last week while I was thinking about writing this recipe post: my friend Dorothy invited me to an impromptu dinner at her house. I jumped in my car and headed down the hill before remembering her mention that the fig tree in her garden was particularly bountiful this year. So I turned around and went home to grab my camera in the off chance there was enough evening light to get photos of the figs for my post. Lucky chance. The tree was overflowing with plump, perfectly ripened blue-black figs and I arrived at the magic hour when lighting was superb. Little did I know, however, that Dorothy was making my signature Pork Tenderloin with Figs and Balsamic Sauce recipe for dinner—the very same dish that I planned to feature in this post! As one of my former cooking students, I taught her to make this dish years ago. Not only did I get beautiful photos and figs for the post but I got to enjoy my dish prepared by Dorothy. How’s that for serendipity? As much as I love summer and hate to see it go, I have to admit that September is my favorite month of the year. The last, lingering days of the season bring a special sweetness to our table with intense, sun-soaked flavors of late summer fruits like vine-ripened tomatoes, plums, and…figs. 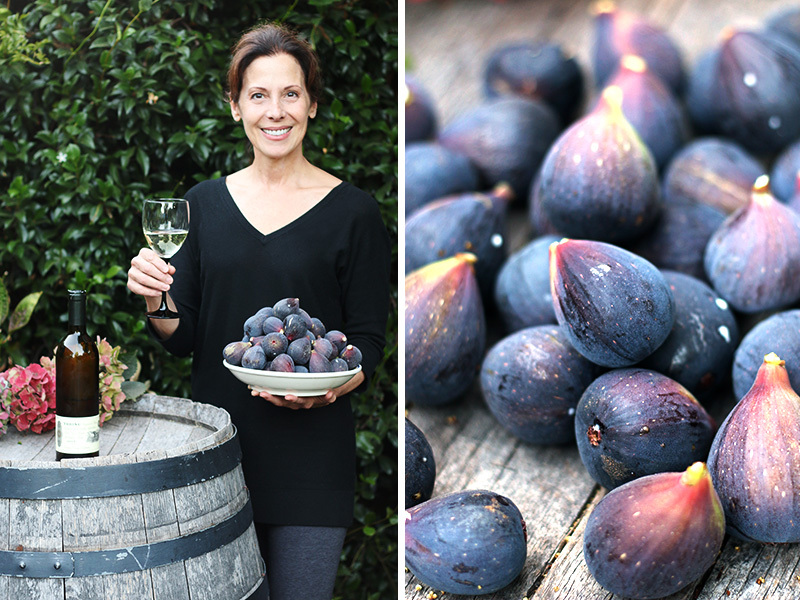 I especially love figs and relish the fleeting moment in late September when they are ready to pick and eat as is or with little embellishment. 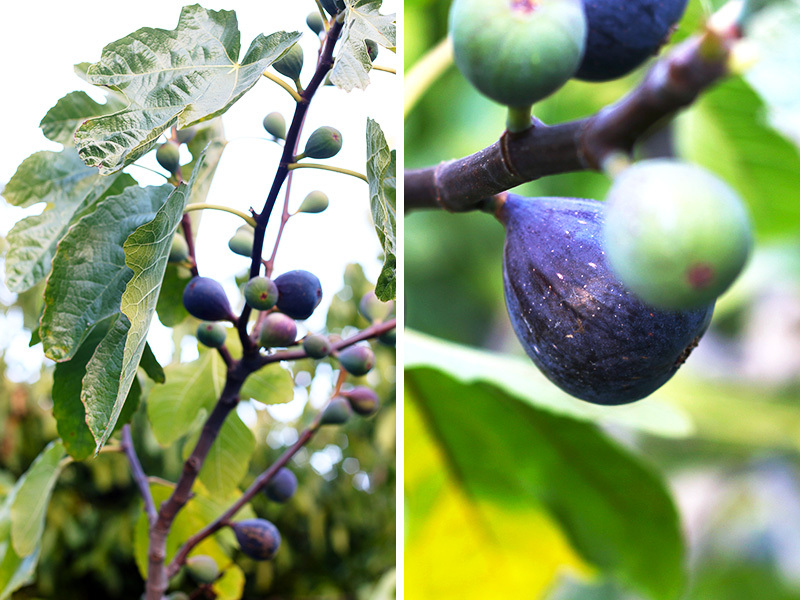 In Italy, I would patiently wait all summer until the figs on my tree wept a little tear drop of nectar, telling me it was time to pluck them off the branch and bite into their sweet, sensual dolcezza. In fact, this ancient fruit tree is analogous with the warm, arid temperatures of the Mediterranean and considered a sacred plant and symbol of abundance. Its large, fan-like leaves trace back to the Bible as the first clothing worn by Adam and Eve and the succulent, meaty figs represent the divine fruit of the Gods. Figs’ evanescent nature along with their luscious, honey-like sweetness and unique texture makes them a precious culinary delicacy worth savoring in season. The soft, pear shaped fruit has smooth skin that easily opens to reveal a surprisingly colorful and intricate fabric of flesh woven with tiny edible seeds that tickle the palate and heighten pleasure. Depending on variety and location, fresh figs are available for a brief period from July through late September and range in color and subtly of texture. Kadota figs are soft, sweet, and juicy with thick, green skin and purple flesh and best eaten raw with skin peeled for better digestibility. 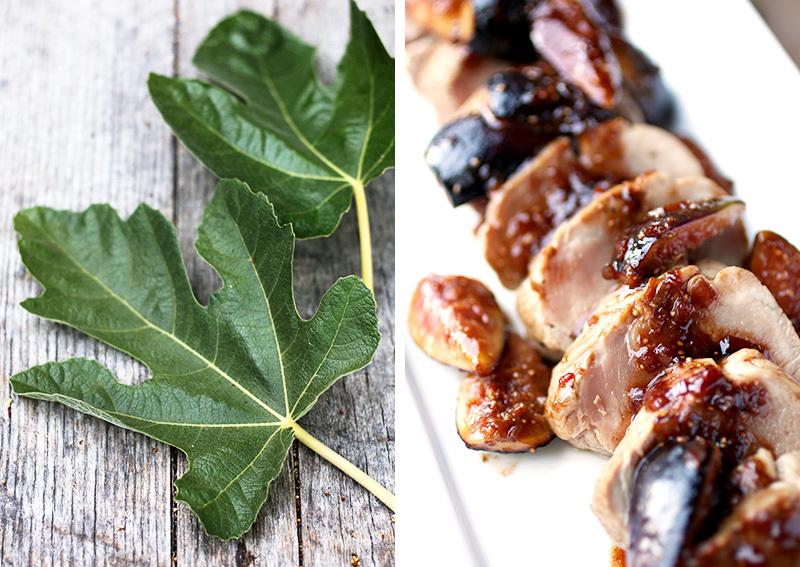 Brown Turkey figs are sweet and very delicate with purple skin and juicy red flesh. 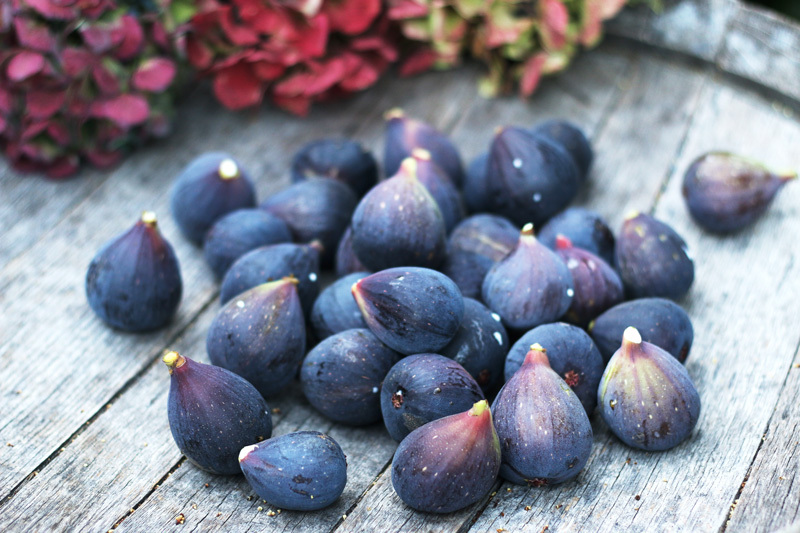 Black Mission figs are the sweetest and least delicate with edible, paper-thin bluish black skin and pink flesh. For this dish, I use Mission figs and the ones I picked from Dorothy’s tree were plump and candy sweet yet firm enough to cook with. But figs are not simply a fruit to eat alone or in a dessert at the end of a meal. Their complex flavor and texture lend to exciting pairings with savory ingredients for unforgettable dishes worthy of an annual pilgrimage. Each year, Italian tables are graced with platters of picture perfect figs and vellum-thin slices of rosy prosciutto in the beloved classic prosciutto e fichi. It’s a combination made in heaven—one might say—and worth waiting until late summer/early autumn for. 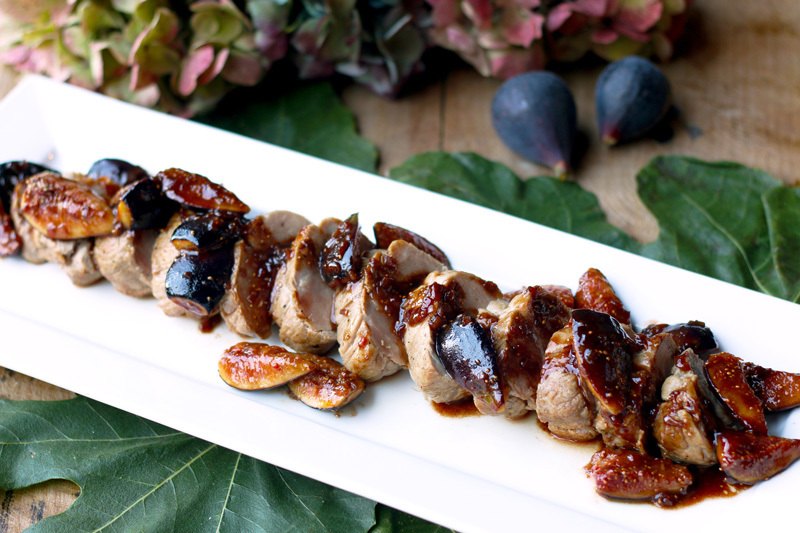 I created my Pork Tenderloin with Figs and Balsamic Sauce recipe inspired by this magical marriage where candy-sweet figs compliment the salty earthiness of pork. For my dish, I roast pork tenderloin until golden outside and pink inside then slice it into thick medallions. I make the sauce by sauteeing shallots in the pan used to sear the pork and deglaze it with Dry Marsala wine to capture all the caramelized goodness. An addition of good quality balsamic vinegar from Modena adds a rich, seductive note to the sauce as it reduces down to an amber syrup. 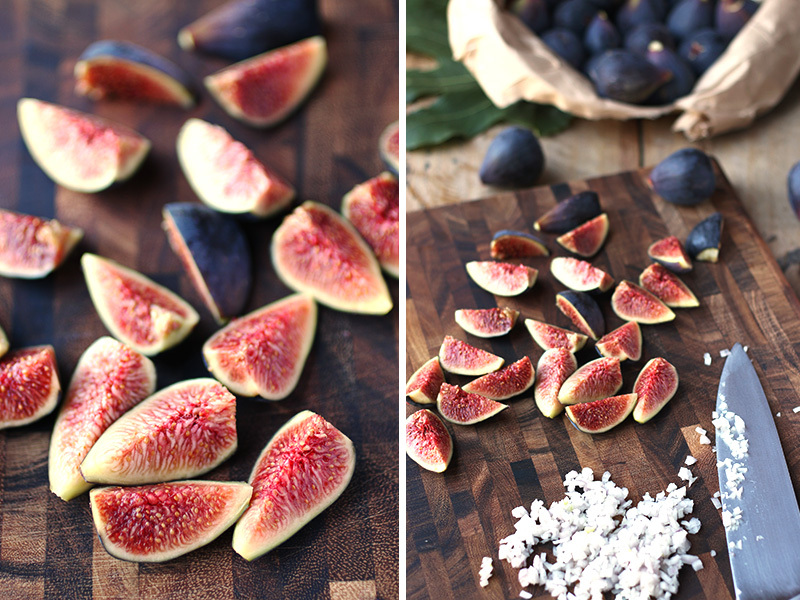 Lastly, quartered figs are warmed in the sauce just enough to bring out their natural ripeness and coat them with a nectar-like sheen. When I pour the sauce over the roasted pork, it is bejeweled by the glossy, fig-studded glaze and smothered in sweetness. It’s a sumptuous dish fit for a king in both presentation and complexity of flavors yet surprisingly simple and quick to prepare. After snapping photos of the tree and figs, I sat down in the garden with Dorothy and David for our obligatory aperitivo before dinner. We raised our glasses to the glowing harvest moon peaking over the horizon, signaling a new season dawning and the close of a season ending with a lingering sweetness that only September can bring. 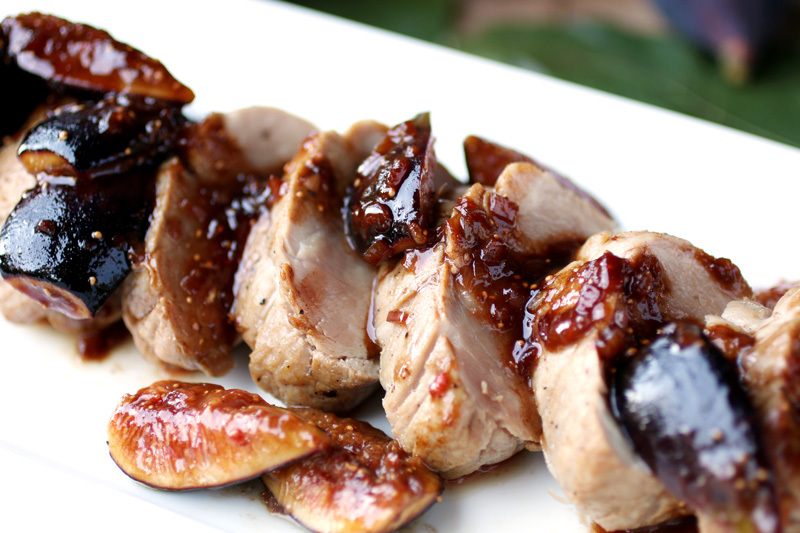 **In this video I show TV hosts Spencer and Janelle how make my Pork Tenderloin with Figs and Balsamic Sauce. Clean the tenderloin by trimming off any excess fat and removing the silver skin (sheath of sinew covering the meat) by sliding a sharp, thin knife blade under the skin and pulling it off in strips. Fold the tail of the tenderloin under if it is long and thin, then tie the pork at 1 1/2-inch intervals with kitchen string to maintain a uniform shape. Heat the olive oil in a heavy skillet or sauté pan over medium-high heat. Pat the surface of the pork dry with paper towel then season well on all sides with salt and pepper. Place the tenderloin in the hot oil and sear it on all sides until a golden crust has formed, about 5 to 6 minutes. Transfer the tenderloin to a baking sheet, setting the skillet aside for the sauce. Place the baking sheet in the hot oven and roast the pork until a meat thermometer inserted into the center of its thickest part registers 145°F/63°C, about 10 to 12 minutes. Transfer the pork tenderloin to a carving board, tent loosely with foil and let rest for 10 minutes while you prepare the sauce. Spoon off any excess fat from the skillet and place over medium heat. Add 2 tablespoons of the butter and the shallots then season lightly with salt. Cook the shallots for 2 to 3 minutes until softened, stirring occasionally. Pour in the Marsala wine and bring to a boil while scraping the bottom of the pan with a wooden spoon to release any bits of caramelized residue. Simmer the wine until all alcohol fumes have evaporated, about 1 minute. Add the balsamic vinegar and reduce the heat to low. Cook gently until thickened to a medium consistency, adding any meat juices that have accumulated on the carving board. Remove from heat and add the remaining 1-tablespoon butter, whisking to obtain a smooth, glaze-like sauce that coats the back of a spoon. Taste the sauce and adjust seasoning if needed. Add the quartered figs to the pan and gently toss in the sauce until warmed through and glazed. Remove the string from the tenderloin and slice it crosswise into ½-inch thick medallions. Arrange the pork medallions in a neat row on a serving platter and pour the fig sauce over top.